For any company to truly grow and succeed it needs to use various tools from within its own organisation to achieve its goals, from great staff to functional offices, businesses may be missing out on a tool that can help their business grow – Digital Signage. In this blog I will try and explain the benefits that going digital with signage can bring and why your corporation needs it now. 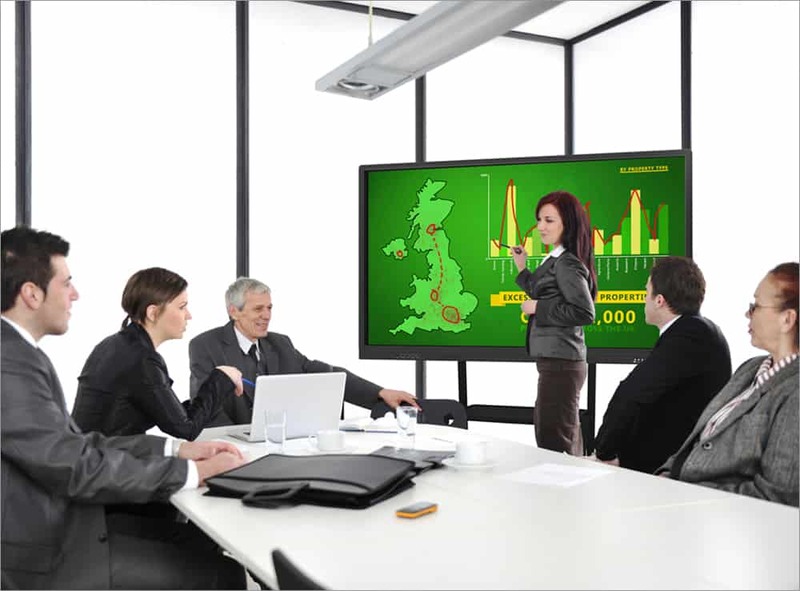 Interactive Whiteboards – Meetings are commonplace within any organisation, large or small. The meetings of minds and businesses require all the necessary tools to succeed. The Interactive Touch Display is the best tool a corporation can have for meetings, presentations and training sessions. 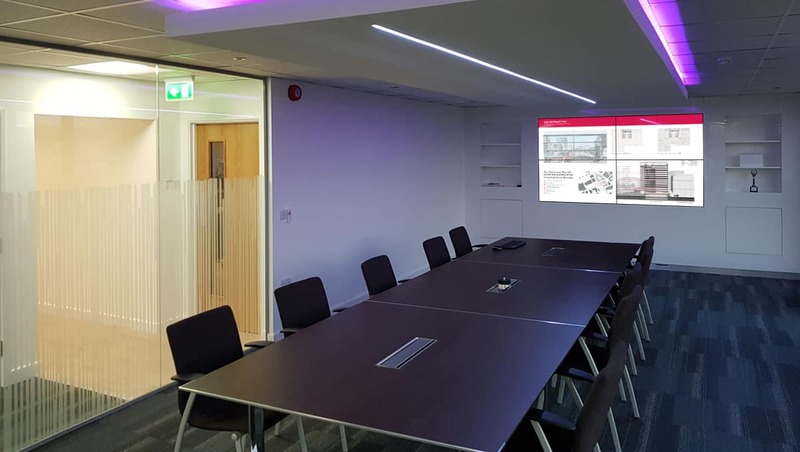 The sharing of ideas is a crucial aspect in many meetings, the Interactive Touch Display easily allows you to share images, videos and other files to and from the screen to mobile devices and laptops (and vice versa) seamlessly. You can wirelessly mirror the display in both directions without the need for annoying wires or additional transmitters allowing your meetings to run smoother and be more productive. It is the ultimate tool for corporate collaboration. Video Walls – A business mantra often touted is to ‘go big or go home’, this mantra definitely applies to a corporation’s Digital Signage with LCD Video Wall displays. Video Walls have fantastic diversity and can work in a variety of different applications for corporations. In larger meeting rooms we have seen the installation of Video Walls so that everyone gets a view of the screen. Small screen sizes in meetings are more likely to lead to attendees switching off, that won’t be the case with a Video Wall though. A Video Wall is statement Digital Signage display, the large sizes present a premium display and that is why successful business often place Video Walls in lobby areas, so as to create a big impression with clients and visitors they choose the biggest Digital Signage displays. Internal Communications – Digital Signage is not all about creating an impression to those outside your business though, if used right Internal Communication can be cultivated by Digital Signage to produce a positive working environment. Think of a Digital Signage display like a modern pin notice board, however instead of scrappy posters and notes you can display well designed, clear announcements to employees. From displaying recent sales figures to the next work social event all of these can help employees feel more informed, motivated and included in a company’s success. To read more blogs about internal communication click here and here. Wayfinding and Room Booking – In large office buildings there are often numerous meetings rooms and offices to navigate around. 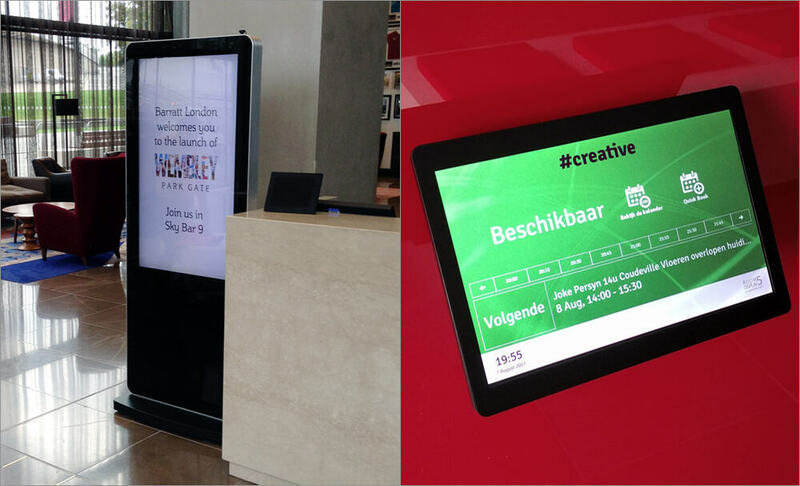 Displays such as our Android Freestanding Digital Posters can be used for wayfinding to direct people around such buildings. Our 10” POS Touch Screens can also be used as part of a room booking system. A successful network can be built to be more flexible cutting down exponentially on the need for administration paperwork and allow for an increase in productivity. Flexibility is key in business and that is why Freestanding Digital Posters are perfect for businesses. Available in a touch or non-touch version the displays can be moved around to be perfectly positioned for maximum impact whatever the job. From being a wayfinding display in labyrinth-like corridors to greeting attendees at a presentation to being a check in point for meetings in the lobby area the possibilities are endless with displays like these. Businesses both big and small can reap the benefits that Digital Signage displays can bring. In this blog we have covered multiple areas in which output can be increased and made better with the introduction of Digital Signage displays. Don’t underestimate this technology; Digital Signage as a tool can work for a business to help it succeed.